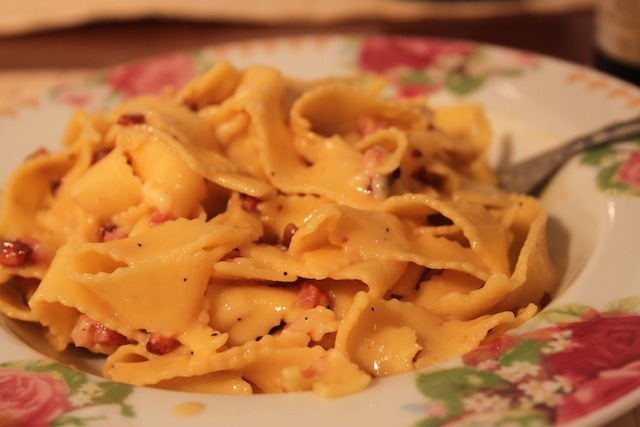 Things I’ve Never Done: Spaghetti Carbonara – Eat Me. Drink Me. I don’t think of myself as a particularly brave person. I don’t have stories about skydiving in New Zealand or bungee-jumping off bridges. I’ve never lived in a third-world village or gone on a solo trip through some really high mountains in a country whose language I do not speak. And I honestly couldn’t think of anything, with the exception of a few stupid stunts I’d pulled in college. And those were stories which, though funny then, would make me seem like that person now. So – no. My life is lame, I thought. I should pack up my bags and go to Nepal or live with the Massai for a year or go ice fishing with the Inuits. And learn Yupik. Probably I should learn Yupik. Or something. But is that what it means for me to live an interesting life, a brave life? Is living bravery on a smaller scale still as brave? Is it relative? People tell me I’m brave for having moved to New York, for then having moved to Berlin, without knowing (in various combinations for each place) whether I’d find a job, an apartment, friends… But I don’t think of these moves as being brave things. They were just things I had to do. So I did them. If I don’t feel compelled to go skydiving, does that mean it’s cowardice not to go? 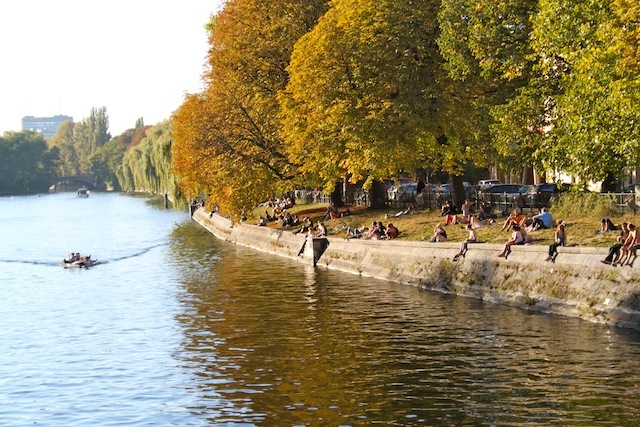 I’ve been thinking about these questions as my life in Berlin settles into place. I’m getting comfortable. Comfortable in my routine, in the way I understand myself and who I am here. But I’m happy. And the feeling I felt before I left New York, that anxious, twitching itch like a circus troupe stuck in my gut – I don’t feel that now. I don’t want to believe that living a brave life is dependent on where you are – and how exotic it sounds. I want to believe that the daily practice of bravery can sometimes be simple and small and that only we can rate its worth. My version of bravery is this: asking for enough money for my work , standing up for the things I need, allowing myself to fall in love. I could add eating raw eggs to the list – though I’m sure my mother would say that this isn’t bravery, jut a bad idea. I want to talk about spaghetti carbonara, which until recently, was something I’d never done before. Partly because my mother has instilled in me a pure terror of eating raw eggs and partly because the idea of having to quickly transfer hot noodles into raw eggs and mix in some other stuff with just the right rhythm before the eggs curdle and you’re left with nasty pasta egg stuff kind of scared me. 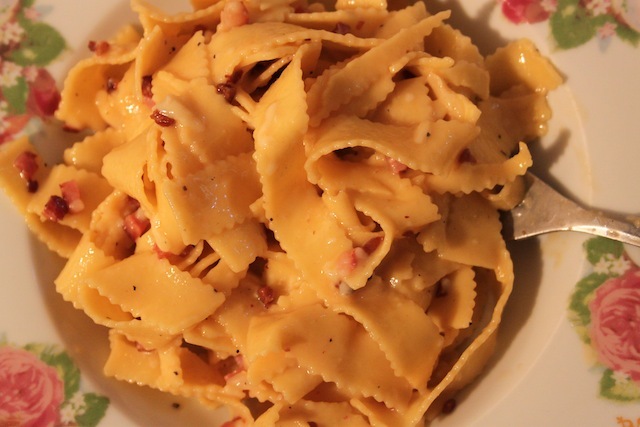 Spaghetti carbonara is simple – it’s pasta, eggs, ham, cheese, and pepper. The only thing that makes it slightly complicated is the technique – the order in which you put it together, the quick wrist flicks that turn raw eggs into silky, rich sauce. As I stood at the stove, however, separating egg yolks from white and listening to the sizzle of fatty pancetta cubes crisping up, I wondered what I’d been afraid of. There was nothing to it but a little prep and a little confidence. Is this bravery? I wondered. Can bravery be so little as to cook something you’ve never cooked before – something which you were afraid of, though in the scale of fears it was a small fear? But for right now, the circus troupe is still. I don’t want to go swimming with sharks and no, I don’t want to learn Yupik and live with the Inuits. I like my life. I like where I am and what I’m doing. So for now, spaghetti carbonara and other small braveries will have to do. Set a pot of salted water to boil. In the meantime, heat pancetta in a slip of olive oil on medium-high heat. When the pancetta has crisped up and slightly browned, remove from heat. Drain the drippings from the meat and reserve. Set the pancetta aside and allow to cool slightly. In a bowl, whisk together egg yolks and the whole egg. When your water is boiling, add enough pasta for two people and cook according to package instructions. Grate cheese and grind black pepper, set aside. When the pasta is al dente, drain, reserving ¼ cup of the cooking water. 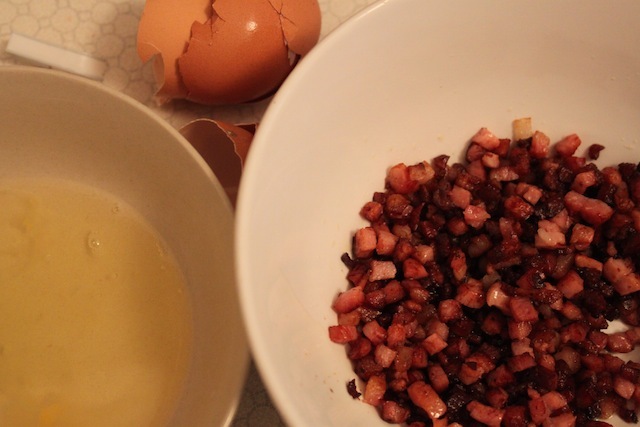 Add pancetta to eggs, then add pasta and cooking water to egg mixture. Using two forks, toss the pasta to coat. 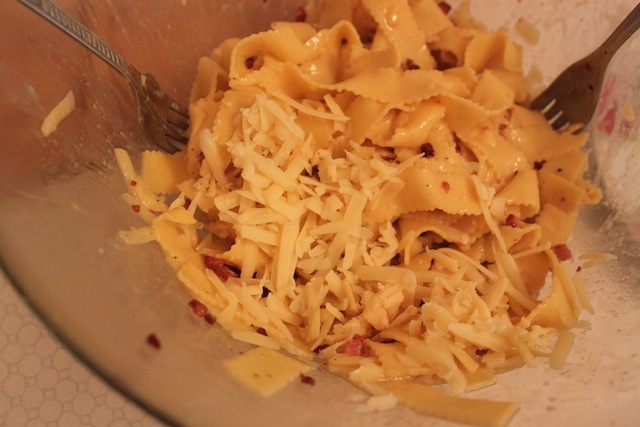 Gradually add pecorino, tossing pasta until everything is one beautifully luxurious melted cheese, egg mess. Add pepper and salt to taste and give it one last, loving toss. *A side note on semantics: I realize it’s a bit of a bold move to conflate “a brave life” with “an interesting life.” I look at it in this sense: an interesting life is one in which an individual makes brave choices on a daily basis. And yet, when I think of an interesting life, I tend to think of something more glamorous than what I’m doing, and therefore much harder than what I’m doing, and therefore requiring more bravery than what I’m giving. So really, the semantics are personal and wide open for debate. Discuss. We have all probably eaten the “raw” eggs without realizing it when we’ve ordered that dish. I believe, or want to believe, that when you add the hot noodles and hot water, you are then cooking the yellow of eggs. Sounds just delicious. On the note about bravery, I believe it takes courage to move away from home, whether you’ve just graduated high school, or any age. To go far enough that you can’t just be there in half an hour is “brave.” And for a person who’s been married and had a family, to pick up the pieces and go start a new life and be a new person ALONE is even braver. You personally have done many brave things as far as isolating yourself from the soft comforting arms of home, by leading a group to Europe, by taking yourself to NY and finding your way around and now all the way to Berlin, finding jobs, apartments, new friends, and far enough away that if you need comforting, you can’t run to any of us. You’re a leader,and in searching for your personal niche in society is about as brave as you can get. I think you are incredibly brave. Falling in love is the bravest thing of all. But, please, no raw eggs.